Rodentia is an order of mammals also known as rodents, characterized by two continuously growing incisors in the upper and lower jaws which must be kept short by gnawing. Rats and Mice are warm-blooded mammals that belong to the order Rodentia. Most rodents tend to be small. Most mice weigh an ounce or two while most rats are less than a pound, roughly the size of an underfed squirrel. The name comes from the Latin verb “rodere” (to gnaw) referring to the gnawing habits of this group. Mice and rats have a long tail that is about the same length as their body. There is no real difference between rats and mice, except that rats are larger and the fear and anxiety caused by rats are much greater. Mice, like most rodents, have large families to help their species survive have litters of four to eight babies five to ten times a year. Mice grow quickly and are often ready to start their own families when they are six-weeks-old. Mice eat almost anything including soap and wallpaper glue. Mice, like rats, are commensals because they share our food and live with us and are nocturnal, staying active while in the dark. Just like rats, they are pests that carry diseases and destroy food and property. Although less threatening than a rat, in some respects, mice can be a tougher pest control problem because of their minute size and ability to enter extremely small holes. Mice only need a ¼ inch gap to gain entry into a building and once inside, require only minute amounts of food and water to survive. Make no mistake about it. Just because mice are “cuter” than rats, they can be every bit as damaging and hazardous to health and property. Just like rats, mice eat and contaminate human and pet foods. Just like rats, they gnaw on electrical wires, shred insulation and gnaw on wood. Mice, just like rats, are capable of transmitting diseases and are well-known for spreading salmonella (food poisoning). "Pleasant, courteous and prompt service with top notch results"
"The representative examined the perimeter of the house and found where the..."
Norway rats are identifiable by their stocky, gray-brown bodies. Their tails are shorter than their body length and their ears are small. Norway rats are larger than most other rat species. Norway rats line their nests with fibrous materials, such as shredded paper and cloth. The house mouse (Mus musculus) can be easily distinguished from deer and white-footed mice by uniform grey or light brown coloration and a nearly hairless tail. The other two species are darker on top with light-colored bellies and tails that are covered with dark fur on top, lighter fur on the bottom. House mice weigh about half an ounce and are about 6 inches in length including a 3-inch tail. 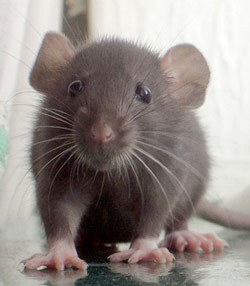 Rats are generally larger than mice. While young rats can sometimes be mistaken for mice, they can be distinguished by their disproportionately long feet. What are the visual signs of rodent activity? Because rats are nocturnal and stay hidden in burrows or behind drywall, actual sightings of rats are difficult. Instead, the focus is on what they leave behind and the damage that they cause. In addition to visual signs, rodents generate various sounds. With rodent infestations, you can often hear gnawing, climbing inside of walls, various squeaks and fighting noises from territorial disputes. Urine stain may occur along travelways or in feeding areas. Rats mark their territory with their urine. Rat colonies have their own smell, so rats from other colonies know when they have reached the borders of an enemy territory. Urine, both wet and dry, is fluorescent under ultraviolet lights. Rodents produce up to 80-100 droppings per day and can easily be detected along runways, in feeding areas, and near shelter. Their droppings are thin and dark. They may be as large as ¾ inch and ¼ inch in diameter. Fresh droppings are soft in texture. Do not expect hard pellets. 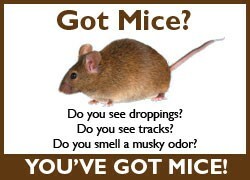 Droppings are one of the easiest, surest signs of a rodent infestation. Gnawing is one of the key tell-tail signs of a mice control or rat control issue. A pest control professional can inspect tooth marks to determine whether they are from rat gnawing or mouse gnawing. Gnawing may be visible on doors, ledges, in corners, in wall material, on stored materials, or other surfaces wherever rats are present. Fresh accumulations of wood shavings, insulation, and other gnawed material indicate active infestations. Rodents also create entry holes form gnawing with mouse holes in the 1-inch range and rat holes are 2 inches or larger. Rats have oil-secreting glands that they use to mark territory and help them navigate repetitive routes. As a result, smudge marks (rub marks) are often found along frequently traveled including walls, beams, rafters, and pipes. Rats memorize pathways and use the same routes habitually. Runs or burrows may be found next to walls, along fences, next to buildings, or under bushes and debris. In dusty loft or basement areas, rats can leave a worn trail of footprints and tail marks, especially in areas that accumulate dirt or mud such as skirting boards, along beams, or leading to access points such as open ventilation grills, gaps in walls and pipes and/or cable entry points. A tracking patch made of flour can be placed in pathways overnight to determine if rodents are present. Rodents often leave behind scraps in sheltered spaces, particularly against walls or in corners such as nut shells. What are the signs of a mice infestation? A mouse infestation has signs similar to a rat infestation. Tiny black droppings are a strong indicator of mouse activity as well as cereal boxes or other containers that have an opening from gnawing. Mice also have a distinctive musky smell that may be noticeable. The mouse prevention and mouse control techniques are similar to those used for rats: sanitation, eliminating entry points into the home or structure, traps, and baiting. What can Cowleys do for homeowners to avoid a rodent infestation? If you believe your home has a current rodent infestation, Cowleys Pest Services will come in and execute a thorough inspection to identify the rodents involved, their access points and the areas of activity so that a comprehensive Integrated Pest Management (IPM) rodent control plan can be designed and implemented. Rats represent a serious threat to human safety and, with their breeding rates, can quickly become entrenched in your home or business. At Cowleys Pest Services, we believe the emphasis should be on IPM. After we identify how the rodents are gaining access to the structure, we eradicate the current infestation using IPM strategies and then most importantly, exclude them from gaining access in the future. This is the most critical step in ensuring that the rodents will not return. Cowleys Pest Services full-service capabilities include structural repairs that may be needed, door sweeps that may need to be added, exclusion work using caulk, foam sealant, hardware cloth, steel wool, and more. You can be sure that Cowleys Pest Services will do the most thorough job to keep your home rodent-free and your family safe. Call or contact them today for a free inspection and estimate throughout Mercer, Ocean, Monmouth, Middlesex County, New Jersey. We are also available for other forms of pest control. Learn more by contacting us!